High quality and high style, this Safavieh Courtyard area rug is extremely useful in any home. Crafted to be an indoor/outdoor piece, its plush synthetic material is unique and comfy at the same time. Its machine-made construction is sure to endure the constant treading of feet and furniture. Maintain your modern home aesthetic with this geometric patterned black rug. This Safavieh Courtyard area rug is sure to make a statement in any room of your modern home. Decor does not have to be hard with this plush synthetic indoor/outdoor rug. This rug is comfy, machine-made, and stylish. Quality and style come first with this geometric patterned orange rug. Improve the overall interior design of your living room, dining room, or hallway with this Safavieh Courtyard area rug. Quality meets modern style in this indoor/outdoor rug made out of plush synthetic material. This rug is comfy, machine-made, and stylish. Maintain your modern home aesthetic with this geometric patterned black rug. Courtyard Oscar Black / Beige 2 ft. x 3 ft. 7 inch Indoor/Outdoor Area Rug High quality and high style, this Safavieh Courtyard area rug is extremely useful in any home. Crafted to be an indoor/outdoor piece, its plush synthetic material is unique and comfy at the same time. Its machine-made construction is sure to endure the constant treading of feet and furniture. 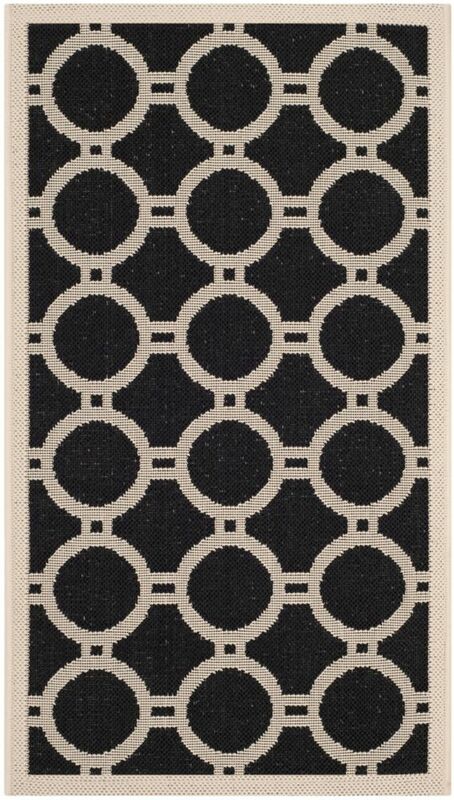 Maintain your modern home aesthetic with this geometric patterned black rug.